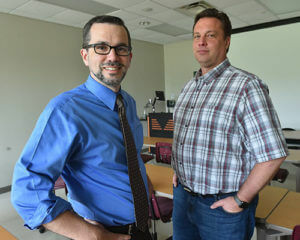 Industrial/Organizational Psychology professors, (left) Cody Cox, Ph.D., and (right) Gregory Pool, Ph.D. The Society for Industrial and Organizational Psychology (SIOP) has ranked St. Mary’s University’s Master of Industrial/Organizational Psychology program 11th overall out of 129 of the top master’s programs in the nation affiliated with the society. “These rankings have helped us validate the hard work and effort our students and faculty put into training outstanding Industrial/Organizational psychologists,” said Gregory Pool, Ph.D., Chair of the Department of Industrial/Organizational Psychology. The Industrial/Organizational Psychology program teaches students how to develop and use tests for employee selection, conduct a job analysis and evaluations, identify organizational training needs, facilitate organizational change, and maximize effectiveness and quality of work life in organizational settings. The program, which provides students with a challenging curriculum and pairs students with alumni mentors to enhance their professional development, earned fifth in Applied Experiences for Students and 15th in Curriculum — two out of five dimensions evaluated by SIOP. According to Pool, the program utilizes the scientist/practitioner model. 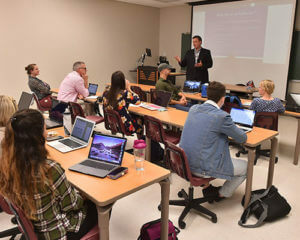 “In addition to learning the theory and science of Industrial/Organizational Psychology, students will have some type of applied project with real clients in almost every class they take,” Pool said. Read more about St. Mary’s University’s honors and rankings.